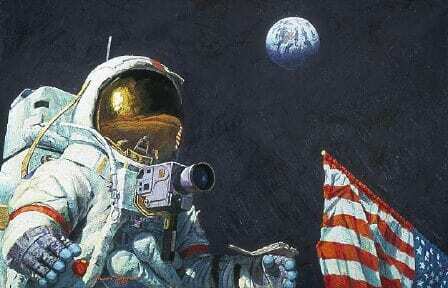 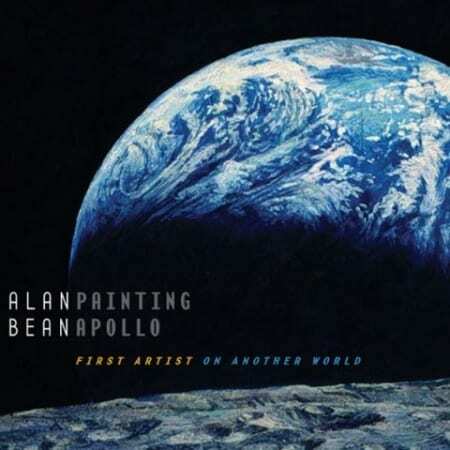 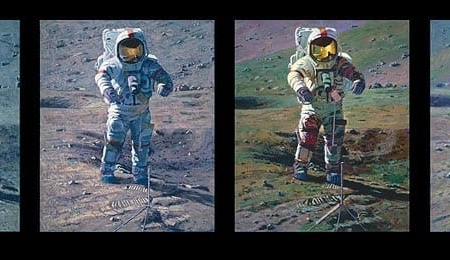 When astronaut/artist Alan Bean first started painting, he experimented with landscapes on earth. 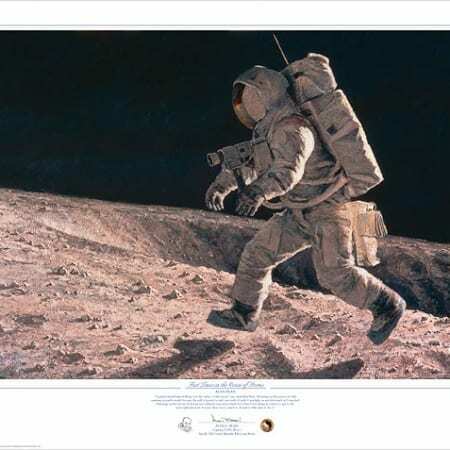 He never imagined that, only a few years later in 1969, he would be walking on a completely different surface — the Moon. 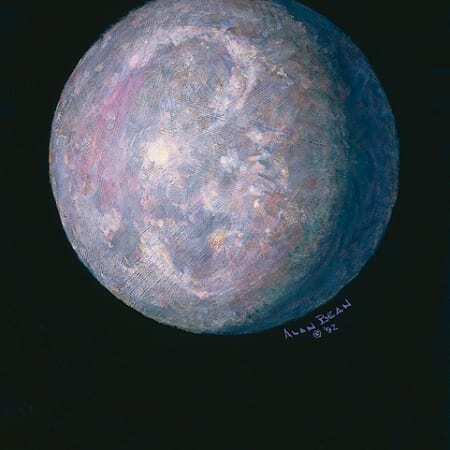 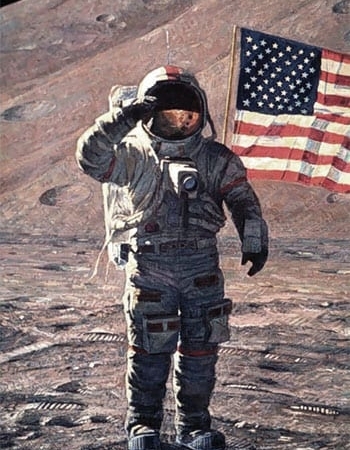 Nor did he foresee a second career as an artist, focusing on the landscape of the moon, as well as images of the earth seen from outer space. 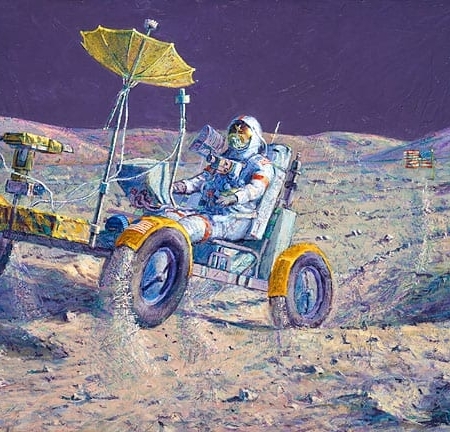 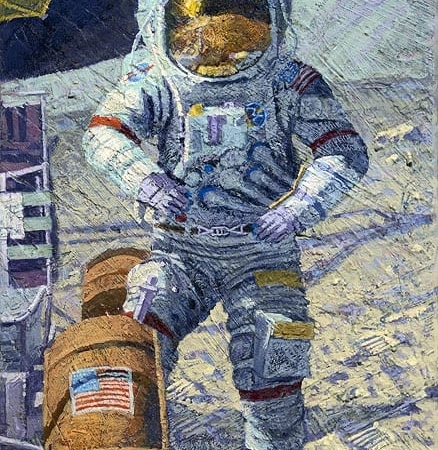 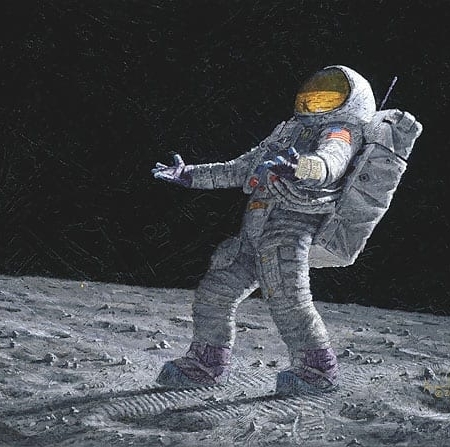 Alan Bean paints himself “running like a gazelle” on the lunar Ocean of Storms, when he became the fourth man in history to walk on the surface of the moon, during the 1969 Apollo XII expedition. 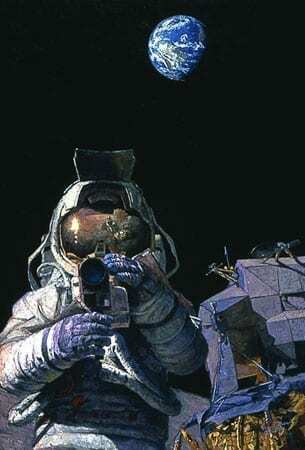 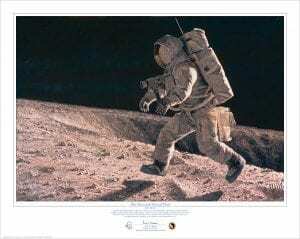 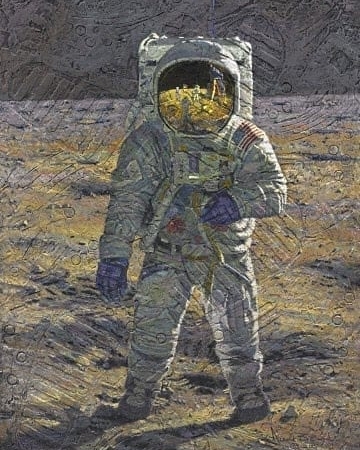 As one of twelve human beings in history to have walked on earth’s moon, Alan Bean is also the only artist in history to paint, from experience, the lunar landscape. 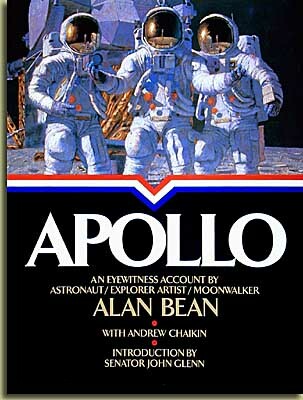 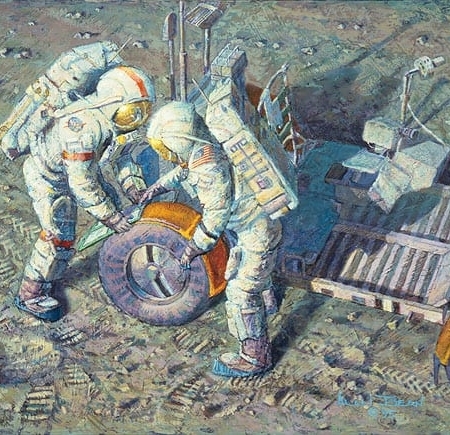 A member of the Apollo XII expedition, the second of six manned lunar landings which took place between 1969 and 1972, Bean resigned from NASA in 1981 to focus full time on what he calls an unprecedented opportunity and challenge — devoting all of his time and energy to painting the great historical exploration of space that defines the Apollo expeditions. 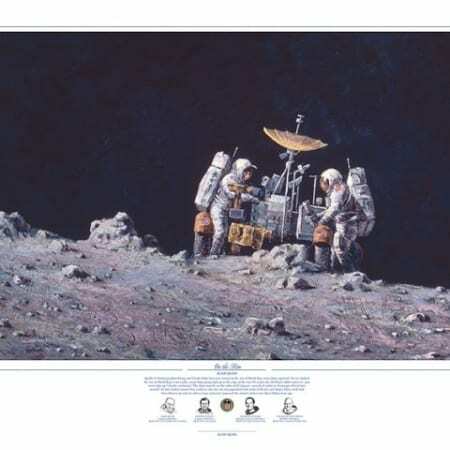 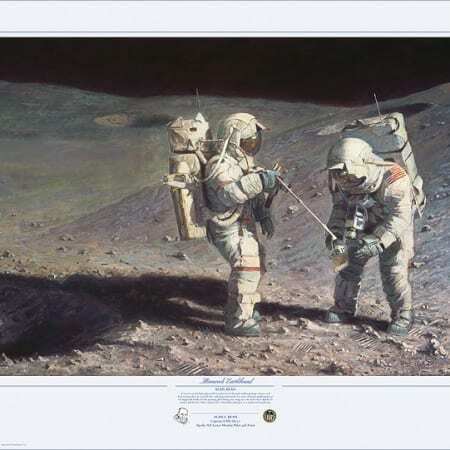 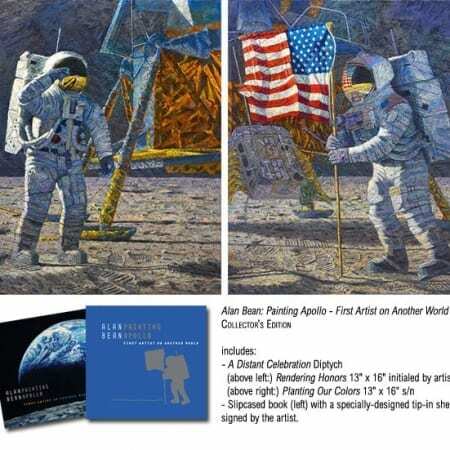 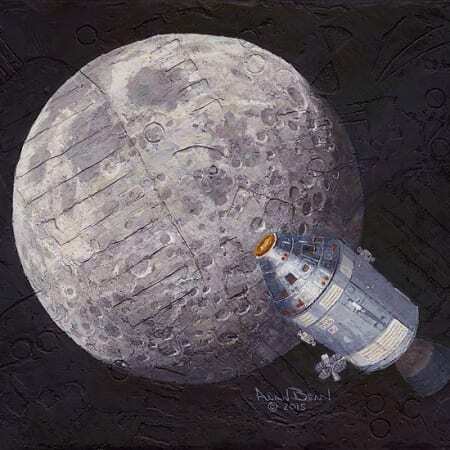 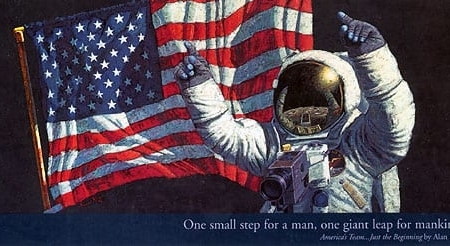 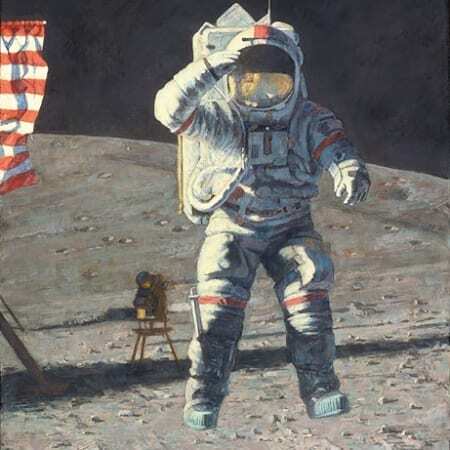 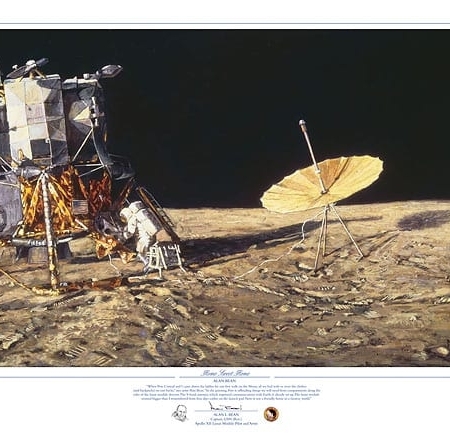 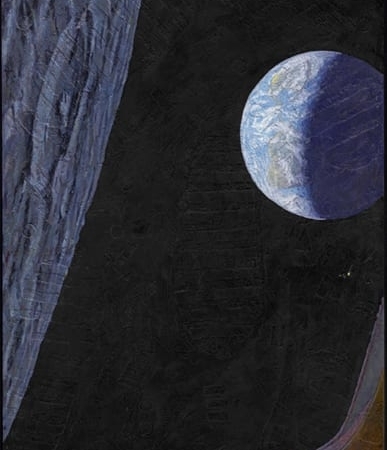 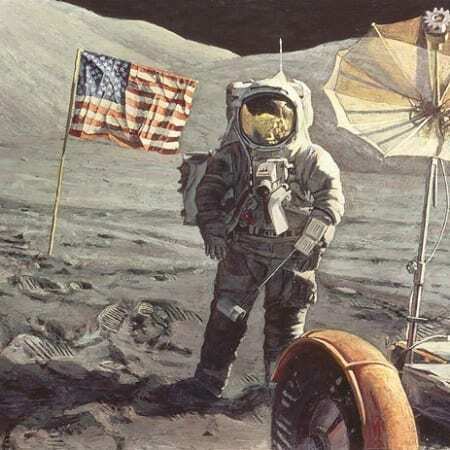 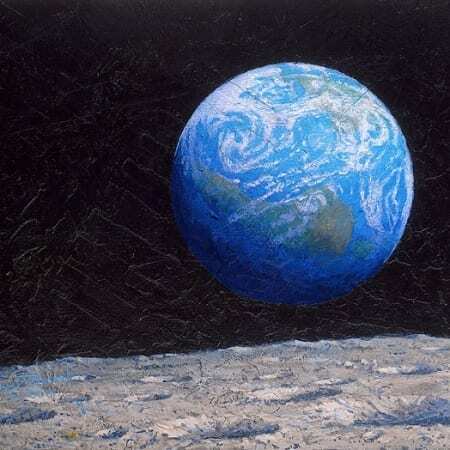 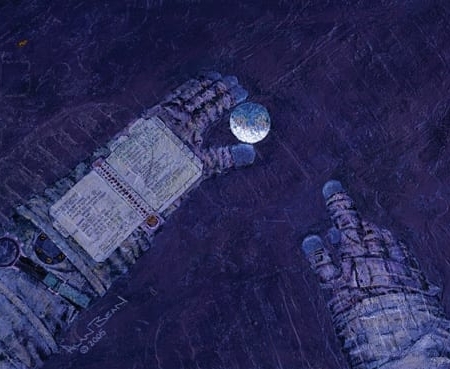 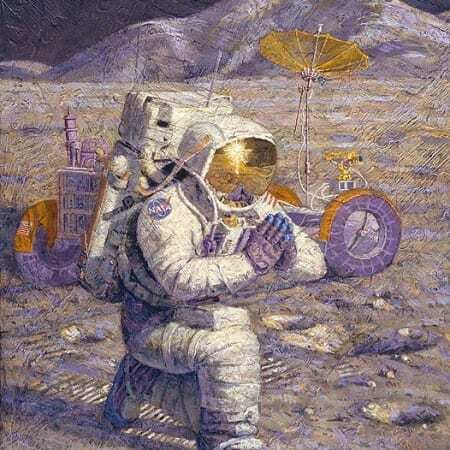 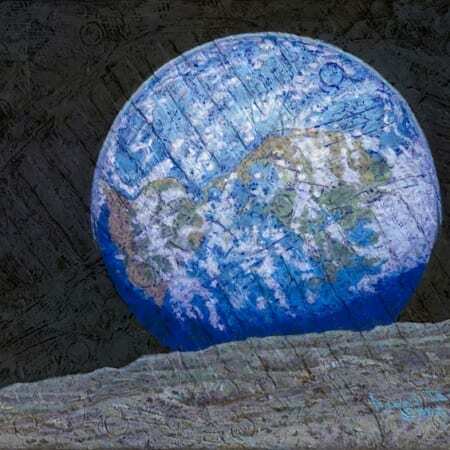 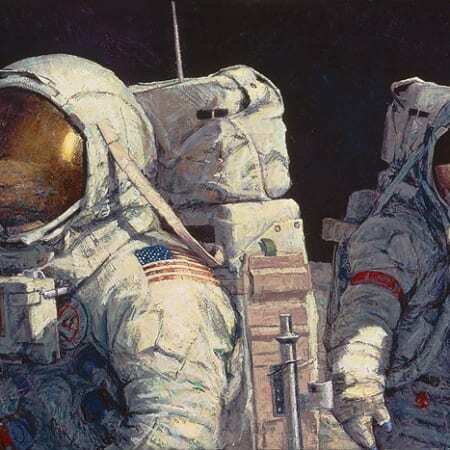 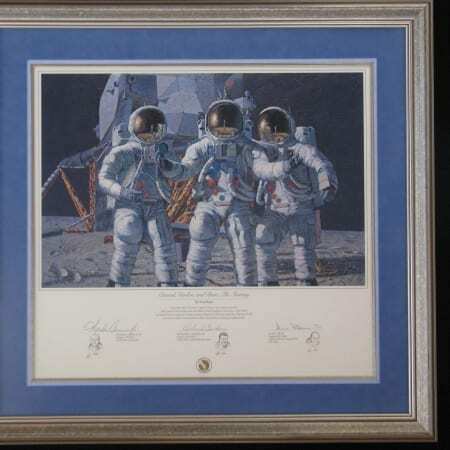 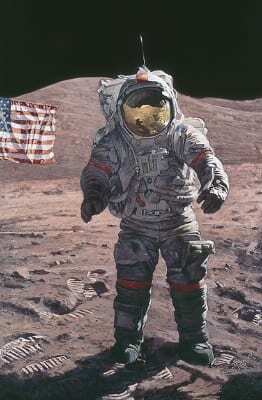 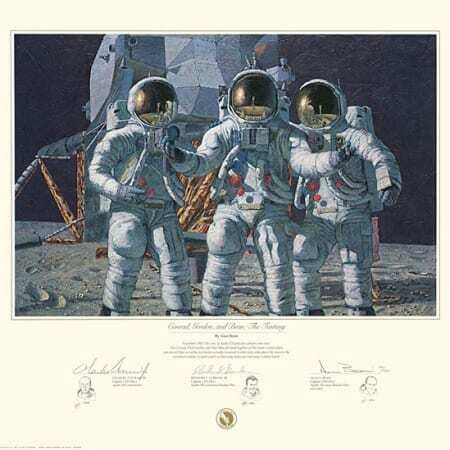 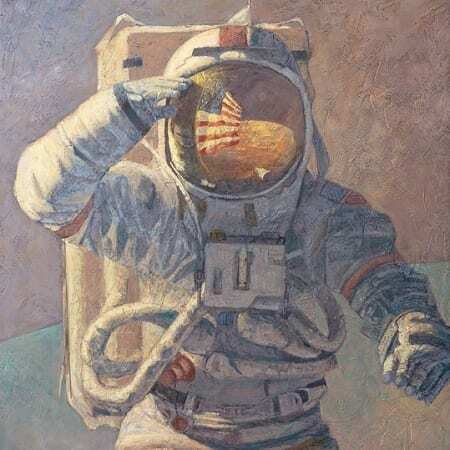 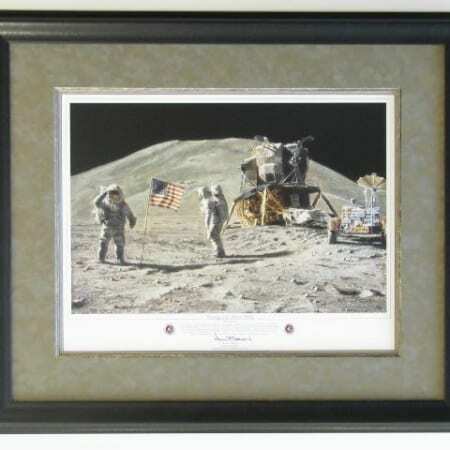 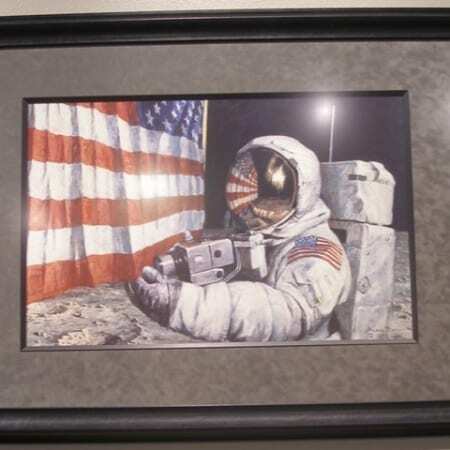 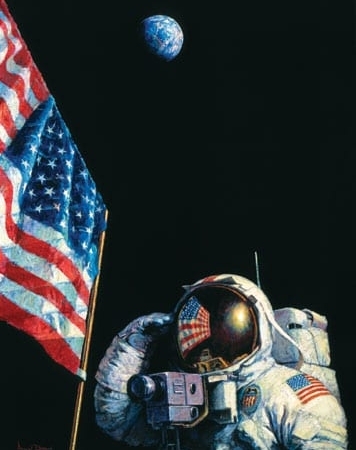 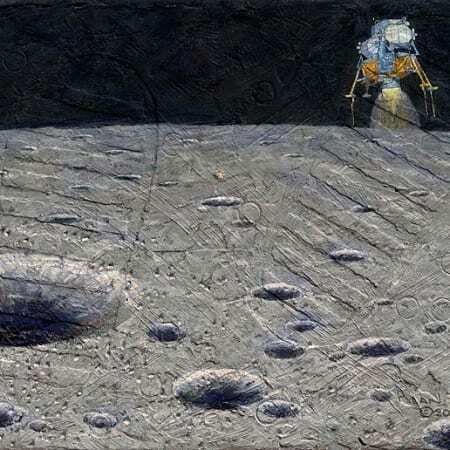 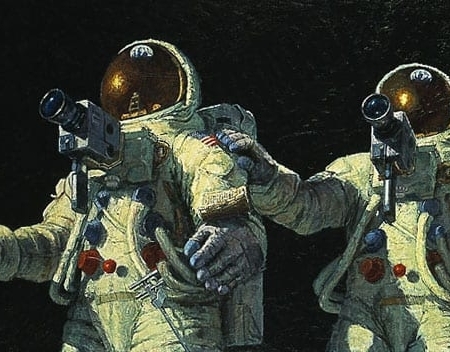 “You can create the very first paintings in all of history of a place other than our own planet,” his fellow astronauts said, as they urged Alan Bean to use his skills to paint his, and their, Apollo experiences on the moon. 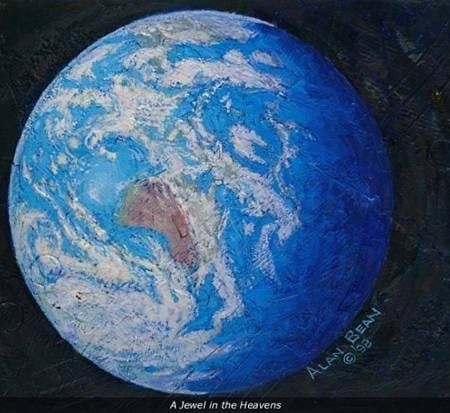 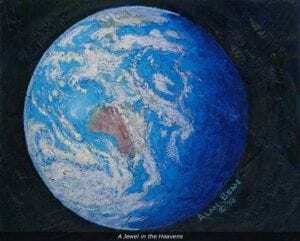 Seen from orbit during the Skylab Mission II expedition, earth is A Jewel in the Heavens captured by the artist’s hand and eye of astronaut and painter Alan Bean. 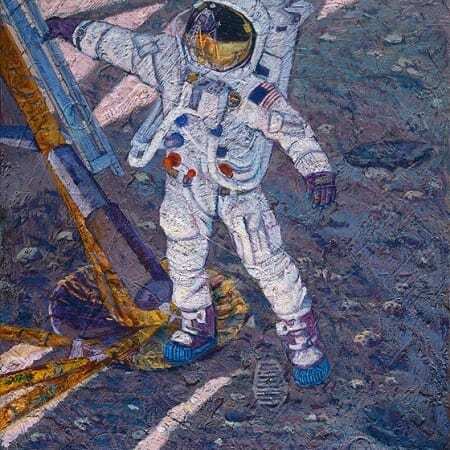 Realizing that the people who instrumentally participated in man’s first great foray into space travel would be gone within 40 years, Bean knew that if any credible images of the adventure were to be passed onto future generations, it was up to him to create them. 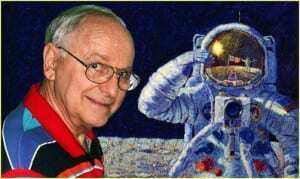 In addition to being the Lunar Module Pilot of Apollo XII, Alan Bean served as commander of Skylab Mission II, during which time he spent 59 days orbiting Earth. 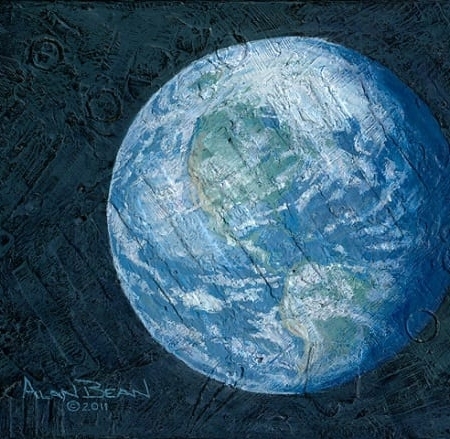 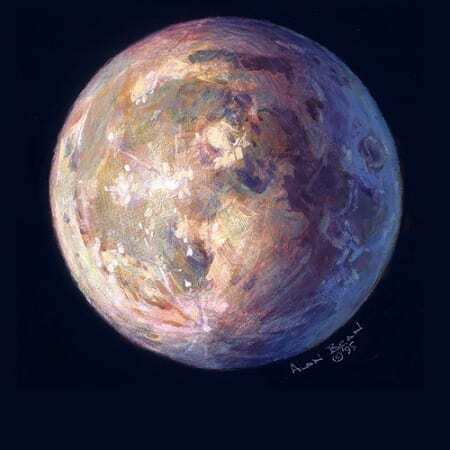 Images of the blue planet from space are also a major feature of Bean’s art. 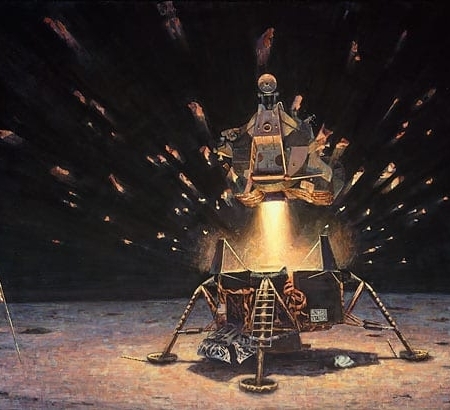 In all, during Alan Bean’s career as an astronaut, he logged in 1,671 hours and 45 minutes in space; on his 59-day flight as part of Skylab Mission, he set a world record of 24,400,000 miles traveled in space. 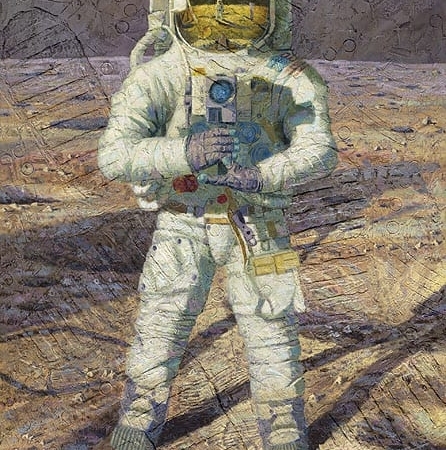 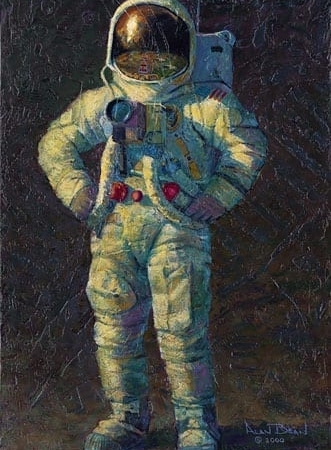 Through the years, Bean’s visual documentation of his lunar and space experience has evolved in style and media, and in many of his original works, he incorporates multi-media elements such as footprint impressions from the astronaut’s boots, and texture made from lunar tools, bits of the Apollo XII spacecraft, and sprinkles of moondust. 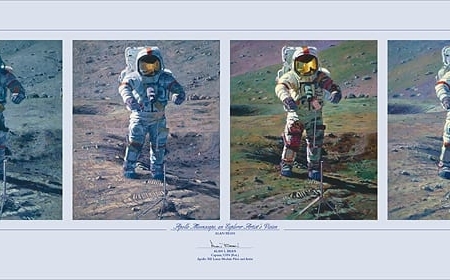 These elements are evident in the fine art editions made of Bean’s work. 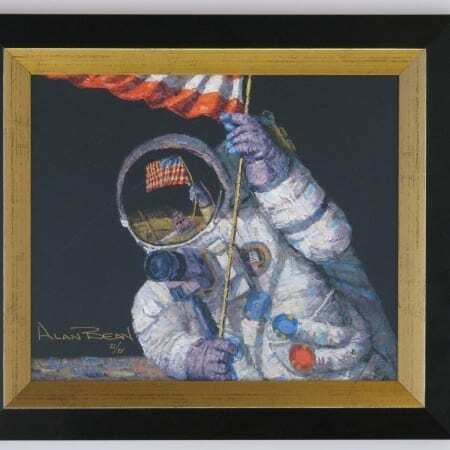 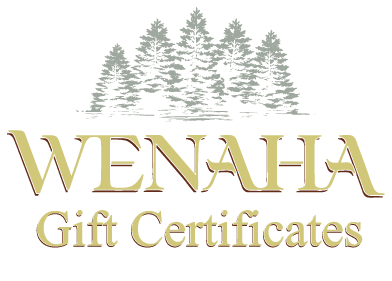 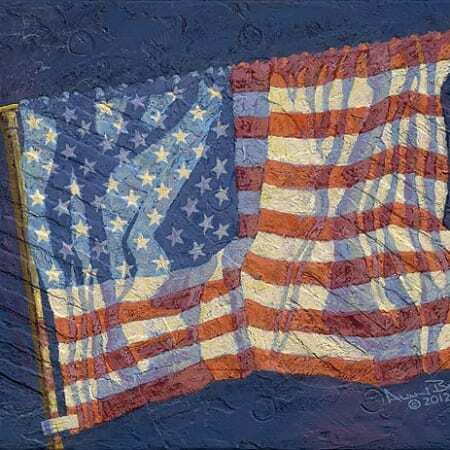 At Wenaha Gallery, we carry a rich selection of Bean’s artwork as fine art editions, artist proofs, books, and posters.